This is a trail on the western slopes of the Catalina Mountains below Samaniego Ridge. Most of these trails in this area are used as mountain bike trails but do see some hikers, especially as you get higher up on the slopes of Samaniego Ridge. There is a maze of trails in this area many of them are not official named routes. Signage in this area is nonexistent. This trail is entirely on National Forest but access is from State Trust land and a State Trust Land Permit may be required. I was informed by the locals that hiking in the area didn’t require a permit but parking on state Trust Land probably does. The rules for State Trust Land require that you get a permit if entering Trust Land. I went on line and got a year pass for $15.00 to be on the safe side. The Majority of the trails in this area are on National Forest but the Trail Heads are on Trust Land. Accessing this trail is from the Golder Ranch Road Trail Head via the Middle Gate Trail and the 50 Year Upper Trail or from the Cherry Tank Trail. 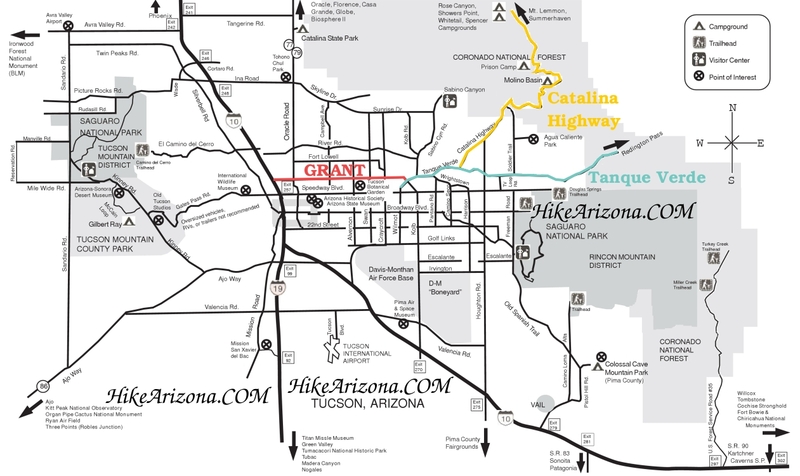 This trail is a short 1.1 miles that connects the 50 year Upper Trail to the Cherry Tanks Trail. This trail’s eastern end is at the Cherry Tanks Trail where it crosses Sutherland Creek. The trail heads due west skirting the south side of an unnamed granite peak staying well below the 4175 foot summit. After leaving Sutherland Creek it climbs just over 100 feet to cross over a ridge on the southwest side of this peak. The trail from the creek for the first 0.5 miles is easy to follow and appears to get some bike traffic. This is where I ran into difficulty locating the trail; at the peak of the trail large slabs of exposed granite (slickrock, although it is not slick) become common place. Since this is used as a bike trail I believe the trail follows along these slabs but it is unmarked. For the next 0.5 miles I could only locate small portions of the trail where it came off the rocks and I ended up bushwhacking most of the way. The trail follows down this southwest running ridge that comes down off the large granite hill 4175 to the northeast. Once down the ridge the trail appears again in excellent shape and easy to follow for the last 0.1 mile to the 50 Year Upper trail. Having a GPS with the route is helpful. If you are using this route I have posted, after 0.5 miles in from the east don’t trust what I have use only as a guide to give general direction. The last 0.2 miles are accurate. The key to following the trail is to think like a biker, stay on the flat granite surfaces where possible and at about 0.7 miles in stay on the ridge heading down. There are a lot of sucker trails that head down off the ridge to the east and end up going nowhere. If you have the opportunity to load this route on Google Earth you will see the large granite Slabs at 0.5 miles in where I lost the trail and where I head down the ridge I was just to the east of what looks like the trail. Have fun and happy trail hunting. When on this trail, while not trying to find it, don’t forget to look to back (East) up Sutherland canyon, the views are impressive. There are some very large granite rocks that are the tops of the granitic plutons that rose up in this area. This pluton makes up most of Samaniego Ridge and was a separate event from the mount Lemmon granites. From Tucson take Hwy 77 (Oracle Road) to the town of Catalina. At Golder Ranch Road turn right. Follow Golder Ranch Road until it turns to dirt, go through the cattle guard, take an immediate left on E. Equestrian Trail. follow the dirt road for .6 miles turn right at the corral. Follow the 4WD road .7 miles to trail head at corral and cattle guard.